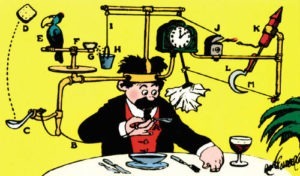 Rube Goldberg was an illustrator famous for depicting complicated gadgets that performed simple tasks in convoluted ways. A Rube Goldberg radio contest is similarly complicated. “Most Christian radio station contests are WAY too complicated. People aren’t going to orient their lives around winning your prize,” writes syndicated radio personality Doug Hannah. The only exception, I’ll add, is that if you are going to Rube Goldberg your radio contests, go all the way and, at least, make it entertaining.